One sunny day, after riding past this funky art collection the last half year and thinking what that might be, I finally went, with a friend, all the way inside the temple ground to get a good look at the exhibition! The wall covers most of the exhibition from outside, so all you can actually see from the road is a display of a female statue on her back, molded in white material with red coloured traces on the surface resembling blood. Above her is to bigger statues, sitting, looking down on her, molded in a darker material, watching her laying on her back bleeding. That in itself, should maybe have been intriguing enough for me to have gone in to have a closer look earlier than I did, I guess! And it was not to our disappointment! A grand display of purgatory! You can say and mean a lot about purgatories, but finally they are religious “tools” and hence to be accepted as that. And as for what Purgatories goes, it has been awhile since I’ve seen such a precise “down to the point’ statement! Drinking is bad! Alcohol, Spirits and everything within those categories will send you straight to hell! - or here, the Buddhistic hell I might add! And purgatory is for all sinners, also on the island. Fallang or Thai, everyone who sins will end up in purgatory is the word. The Holy word that be even!! It has to be mentioned though, that not all Buddhists believes in purgatory or an “afterlife”. Many Buddhist simply believes that they will get reincarnated immediately after the dead of their current body into a new body and therefore has no afterlife or purgatory. Just around the corner from here we have the Tibetan ‘Bardo’ f,ex which is a Tibetan concept of purgatory. “Bardo” means an intermediate state between two lives. It is a concept which came about soon after the Buddha's passing, with a number of earlier Buddhist groups accepting the existence of such an intermediate state, while other schools rejected it. According to Tibetan tradition, after death and before one's next birth, when one's consciousness is not connected with a physical body, one experiences a variety of phenomena. A path through ones lived lives .. These usually follow a particular sequence of degeneration from, just after death, the clearest experiences of reality of which one is spiritually capable, and then proceeding to terrifying hallucinations that arise from the impulses of one's previous unskillful actions. - and I believe, it must be the proceeding to the terrifying hallucinations, that the exhibition is skillfully visualizing! For the prepared and appropriately trained individuals the Bardo offers a state of great opportunity for liberation, since transcendental insight may arise with the direct experience of reality! While for others it can become a place of danger as the karmically created hallucinations can impel one into a less than desirable rebirth and reincarnation. As we know about purgatories and the belief in them, the exhibition loses, luckily some of its terrifying message. Most religions have some sort of purgatory belief. Catholics believe that you have a purification before entering heaven and they call this purification ‘Purgatory’. The visualization of those have also not been of a kind art! The Christian idea of Hell or Purgatory neither. The jewish tradition is also quite brutal against sinners. So all in all, it is not a big surprise to find that the Buddhistic Purgatory is of same kind! These freaky looking statues can be found at Wat Samai Kongka Temple past the Koh Phangan Hospital towards Sri Thanu and Chaloklam. At first, it took a little bit of detective work to find out what they stand for, since there was no monks or local people around when we came to pursue the matter. And as it goes to show on these two photos, one can also end up with a chicken head. If that is for sins against chickens or just a punishment for drinking is left unknown.. It can look a bit concerning when you first cast your eyes on the display. When you then understand that it is an art exhibition about purgatory it is less concerning. Unless of course you believe this to be a possibility yourself. Then you definitely should be concerned! But concerned in the matter of religious conviction, meaning that if you are both a believer and a sinner, this is where you are destined to end up! .. If you believe .. They are in reality using modern art to send a very powerful message! This is a skillfully created art exhibition in sculpture form, symbolising spirituality and a core belief system! It is culture, history, religion, art, captured with and in present day mentality on this island in one expression! Just think of those anti drinking commercials you see, it’s the same sort of thing. Don’t drink, it is bad for you! Respect the temple and the ground when you visit but go have a look and try to invite a monk for a small conversation.. It could end up being an interesting talk and maybe you find that, culturally, religiously and personally, we really do have less differences than we actually have in common. It is a piece of present Koh Phangan, that you may not see again. 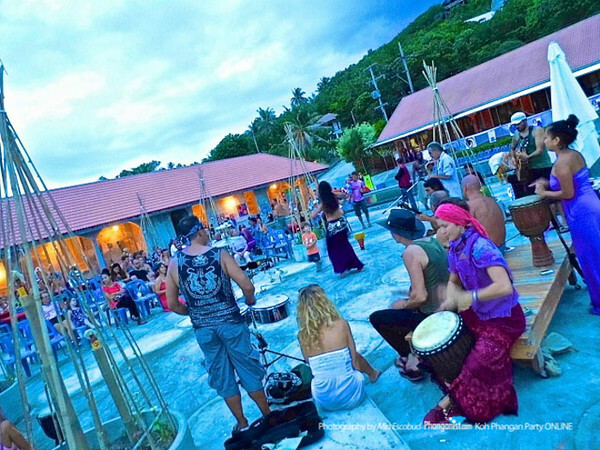 Go and enjoy an exhibition of the absolute unique culture on Phangan. Such a “Phangan present day exhibition” you will not find anywhere else in Thailand. Sometimes it even beats the parties ;) !! Phangan Art Exhibition A Resounding Success!